While many tour operators have moved to Campo Grande, Corumbá offers trips by boat or jeep and access to the major hotel and farm accommodation. Almost all of the Campo Grande agencies have offices here and there are still a number of upmarket cruise companies along the waterfront. Corumbá was one of South America's most important river ports in the 19th century and has beautiful views along the river, especially at sunset, and some remnant colonial architecture. The compact streets include the spacious Praça da Independência and Avenida General Rondon (between Frei Mariano and 7 de Septembro), which has a palm-lined promenade that comes to life in the evenings. The Forte Junqueira, the city's most historic building, which may be visited only through a tour agency, was built in 1772. In the Serra do Urucum hills to the south is the world's greatest reserve of manganese, now being worked. 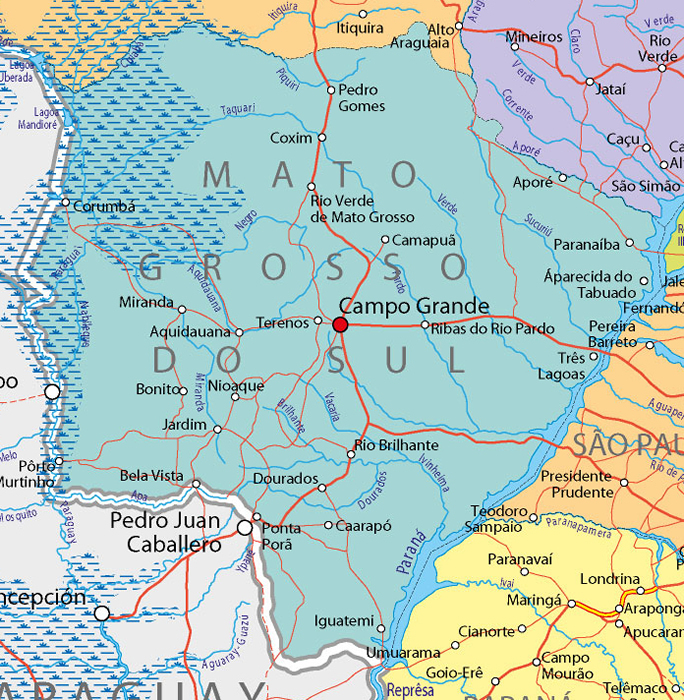 The port town of Corumbá on the Rio Paraguai in the western Pantanal, on the frontier with Bolivia, was once a Portuguese outpost in the middle west, established after the treaty of Madrid (1750), which gave Portugal control of this area. The original nucleus of the town, a military post named Albuquerque, was established in 1778. The commercial harbor was opened in 1853, and thereafter regular shipping services on the Rio Paraguai began. In 1862 Corumbá was given the status of a vila, and in 1878 was chartered as a town. It now has an airport, with daily services to and from Rio de Janeiro, São Paulo, Cuiabá and Campo Grande. It is also linked with Campo Grande (403km/250mi south-east) by BR 262, and since 1914 by rail. In the Casa do Artesão (Craftsmen's House), formerly the prison, regional craft products and articles produced by the local Indians are on sale. On Praça da República is the Instituto Histórico Luiz de Albuquerque, with the Museu do Pantanal (specimens of animals; tools and weapons of the local Indians). The Museum is close to the Rio Paraguai, where visitors can see the port, with its quays, and numbers of 19th century houses. To visit Fort Coimbra (1776), the largest Portuguese fort in this area, permission must be obtained from the Brigada Mista. The fort can be reached only by boat on the Rio Paraguai. The 18th century Fort Junqueira is also on the river. Porto Manga, a good fishing center, lies 62km/39mi south-east of Corumbá on the road to Campo Grande. Here you can leave the overland bus, which must wait for the ferry over the Rio Paraguai.